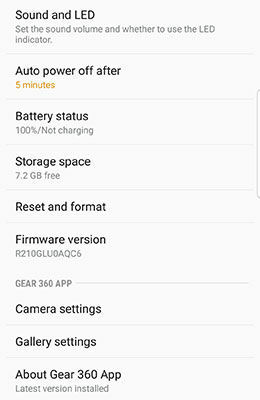 How do I configure the settings of my Gear 360 using the Gear 360 app? With the Gear 360 app, you have complete control over the Gear 360. Settings such as sound, LED, and Auto Power Off are right at your fingertips! Note: Familiarize yourself with the Gear 360 app Settings menu. 1. On your mobile device, navigate to Apps > Samsung Gear 360. • Sound and LED: Adjust the volume of audio cues and enable or disable the LED indicator. • Auto power off after: Set the Gear 360 to turn off after it has been inactive for a set period of time. • Battery status: Displays the current battery level and status. • Storage space: Displays the remaining space on the memory card. • Reset and format: Reset the Gear 360 or format the memory card. • Firmware version: Displays the Gear 360's current firmware version and you can check for any Gear 360 updates. • Camera settings: Adjust settings such as file size, timer, and sharpness. • Gallery settings: Enable or disable tilt correction. • About Gear 360 App: View the Gear 360 app's current software version and you can check for any updates for the app. How do I adjust the options of the pictures and videos taken with my Gear 360?